All the fun without the hassle! 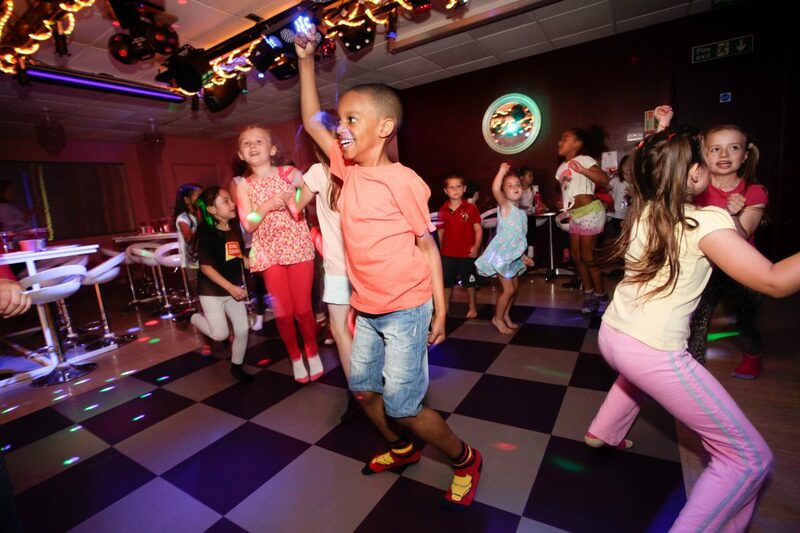 We have everything you need for a really great birthday party in Dunstable without all the fuss – just leave it to us. 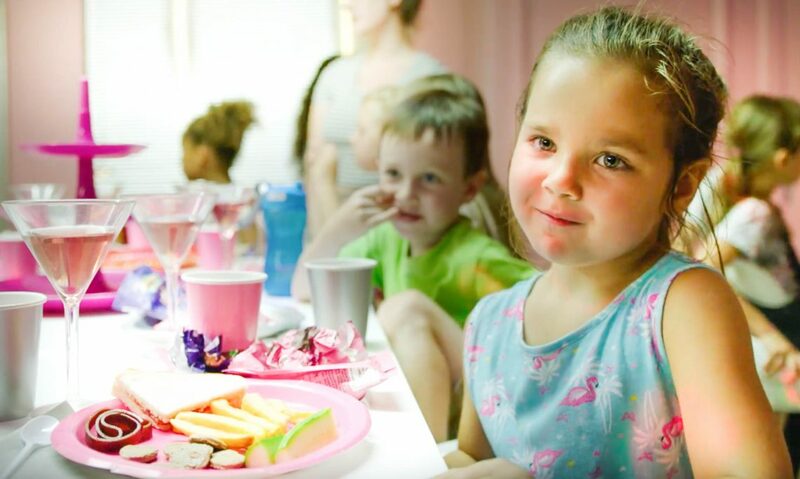 Our helpful and friendly staff will help you create a really wonderful party for your child. Plus you can make your party even more special with our party extras including party games, party bags, an appearance by our cuddly mascot and more. Upgrade to a VIP Disco Party! Get down on the dance floor! With its own dance floor, glittering chandelier, cool bar stools and a glamorous pink theme who wouldn’t love a disco in our special themed room as part of their two hour party? Enjoy your party in a night club themed setting with music and flashing lights. Up periscope! Perfect for mini mariners, complete with portholes where you can see fish and turtles swim by! Sound the alarm and race to the rescue! 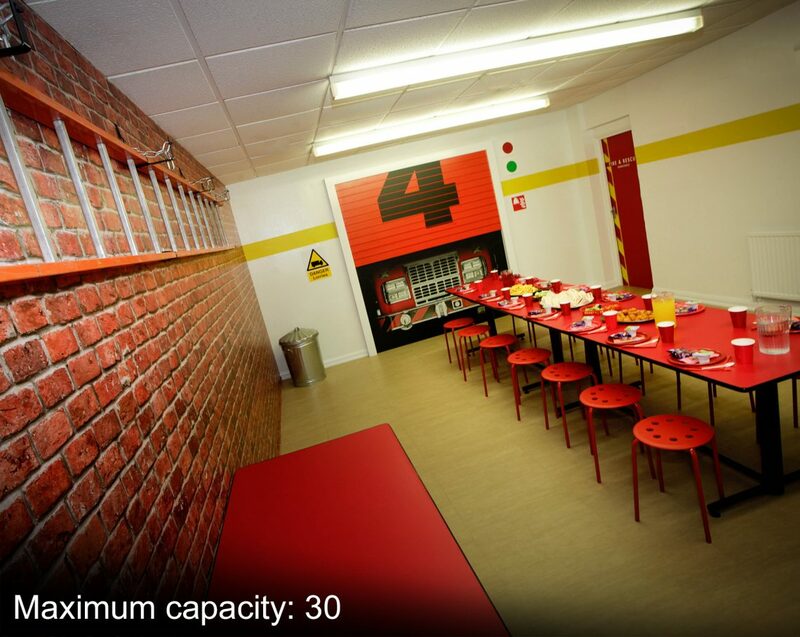 Our Fire Station themed room will definitely heat up your party with firefighting equipment, alarm bell and garaged fire engine! Roll up, roll up! Enter the Dunstable Circus. 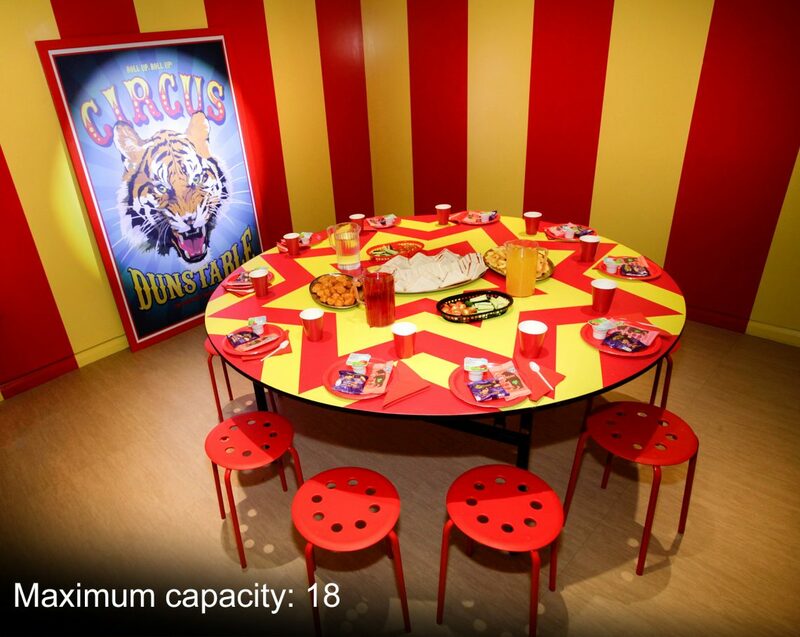 Our brightly coloured circus themed room will really add a splash of drama to your party. 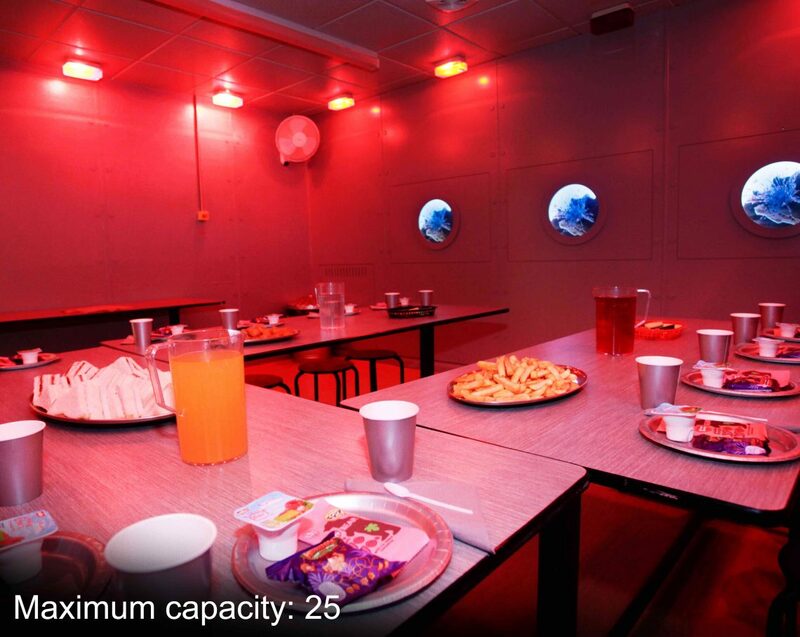 3, 2, 1… blast off into space in our Space Ship themed party room with your party guests! We know how much children like to receive a party bag! Let us put together fun party bags for your guests at £1.50 each. 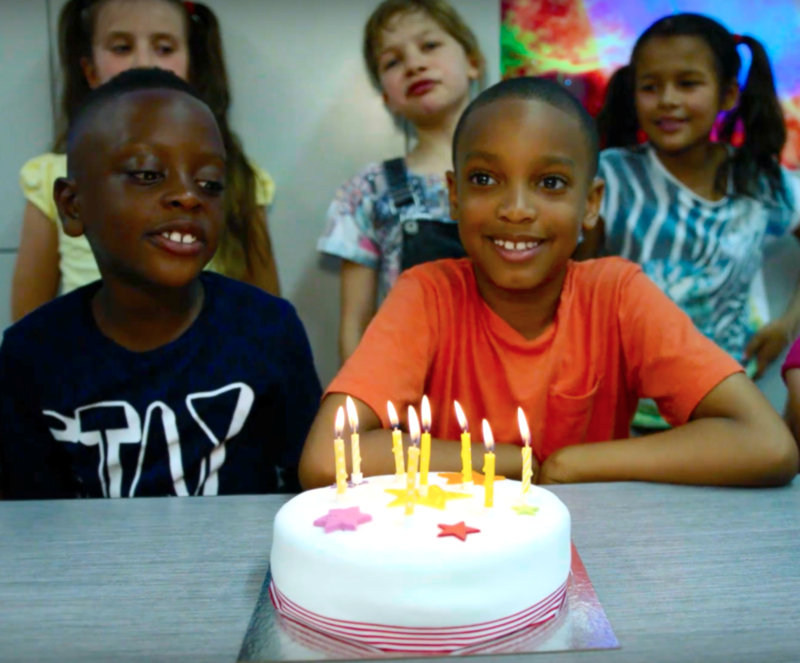 After 60 minutes of play, join in 30 minutes of supervised traditional games such as Pass the Parcel, Musical Statues and Simon Says prior to the birthday meal. (Suitable for children under the age of six. Limited timeslots available daily). After 60 minutes play in the playframe, your guests can enjoy 30 minutes of musical play in a party room. A fun and interactive session for young children, with music, toys, dance and exercise. (Suitable for children under the age of four. Limited timeslots available daily). Our cuddly mascot would love to come to your party! Enjoy a ten minute appearance with our furry friend during your party meal. After 60 minutes of play, join in 30 minutes of supervised traditional games such as Pass the Parcel, Musical Statues and Simon Says prior to the birthday meal. (Limited timeslots available daily). After 60 minutes play in the playframe, your guests can enjoy 30 minutes of musical play in a party room. A fun and interactive session for young children, with music, toys, dance and exercise. (Limited timeslots available daily). Ten mini chicken koftas, five breaded mushrooms, five vegetable crolines, five samosas, five spring rolls and five onion rings served with sweet potato fries, a salad garnish, tomato ketchup and garlic mayonnaise. Ten onion rings, five vegetable crolines, ten breaded mushrooms, five spring rolls and five samosas served with sweet potato fries, a salad garnish, tomato ketchup and garlic mayonnaise. One chicken mayonnaise, one ham salad, one tuna mayonnaise & sweetcorn, one cheese & pickle, two cheese & tomato, salad garnish. Two cheese & tomato, two tuna mayonnaise & sweetcorn, one tuna & cucumber, one cheese & pickle, salad garnish. Check availability with us now! Up periscope! Perfect for mini mariners our submarine room is complete with portholes where you can see fish and turtles swim by! Roll up roll up! Enter the Dunstable Circus. Our brightly coloured circus themed room will really add a splash of drama to your party. 3, 2, 1… blast off into space and into our Space Ship themed party room with your party guests! Unlimited blackcurrant & orange squash (no added sugar) and water. Why not add Slush Mocktails for your party guests for £1.50 a head? We’ve all sorts of options for tailoring your toddler party to make it unforgettable. What are the minimum and maximum numbers for a party? The minimum number of children for both Toddler Parties and Play Parties is 8 and for Private Hire Parties it is 25. Please email us for maximum numbers. What is the deposit and when is the balance due? A £50 deposit is required to secure the booking. Deposit is non-refundable 21 or less days before the date of the party. Balance is due 2 days prior to your party. Once numbers are confirmed is this the fixed amount to be paid for? Your confirmed final number is the minimum number you will be charged for, except where there are less than required (minimum of 8 children). Additional guests will be charged the cost per head of your party. Are babies under 1 year counted as guests at parties? No they are not. Babies under 1 year are admitted free so please do not include them in your party guest numbers. Babies under 1 year will not therefore receive a party meal. If you do wish for a guest under the age of 1 to be included in the party and to receive party food, then please do include them within your numbers. What if I need to cancel my party? You can cancel your party and receive your deposit back 3 weeks or more before the party. Your deposit is non-refundable 21 or less days before the date of the party, however we can arrange for the deposit to be used for a future party held within a year of the initial booking. Are children 3 years old or under attending a Standard Party charged the toddlers price or the standard price? They will be charged the standard price. How do you determine what is ‘Term Time’? We align our prices with state school term dates. Is there an age that is classified as an adult for parties? Children over the age of 12 are classed as adults and are not permitted on the play equipment. How many adults can attend? We recommend a ratio of one adult for every 5 children attending. While we reserve one table of four chairs for each party group we cannot guarantee to seat large number of adults. Our party staff are there to assist in the smooth running of your party and should not be viewed as entertainers. We do have an option to add a visit from our cuddly mascot and other activities see the extras section under the party details. We provide plates, cutlery, cups and napkins and your buffet. All you need to bring is a birthday cake and candles! We regret we can’t allow your own decorations or party poppers as they may cause damage to our rooms. We cater for children and for adults. Other than your birthday cake, your own food is not allowed to be brought into the centre. Alcohol is not permitted either. Is the party food Halal? Our party buffet isn’t Halal but we do offer a vegetarian buffet option. Can we have extra time in the party room? 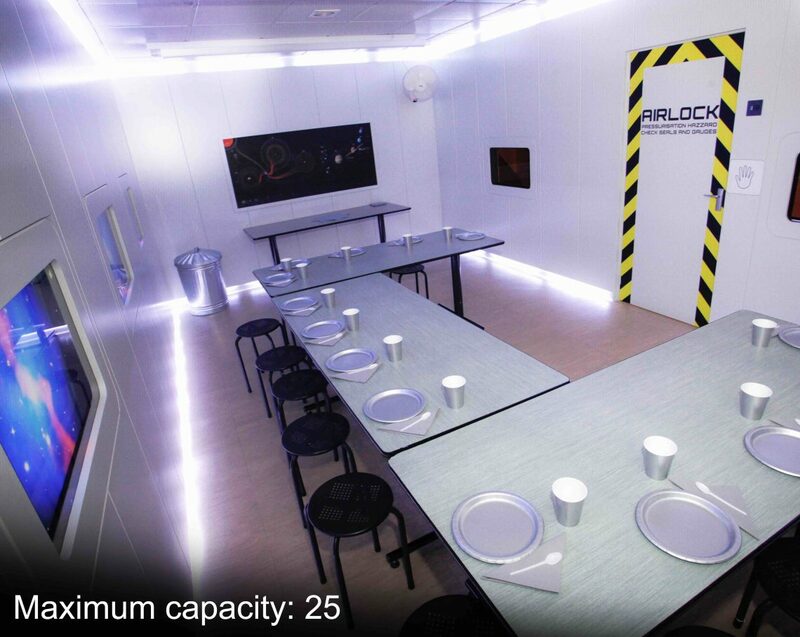 Parties held on weekdays and those starting at 11.00am and 11.30am can have their time in the party room extended to 45 minutes by prior agreement. 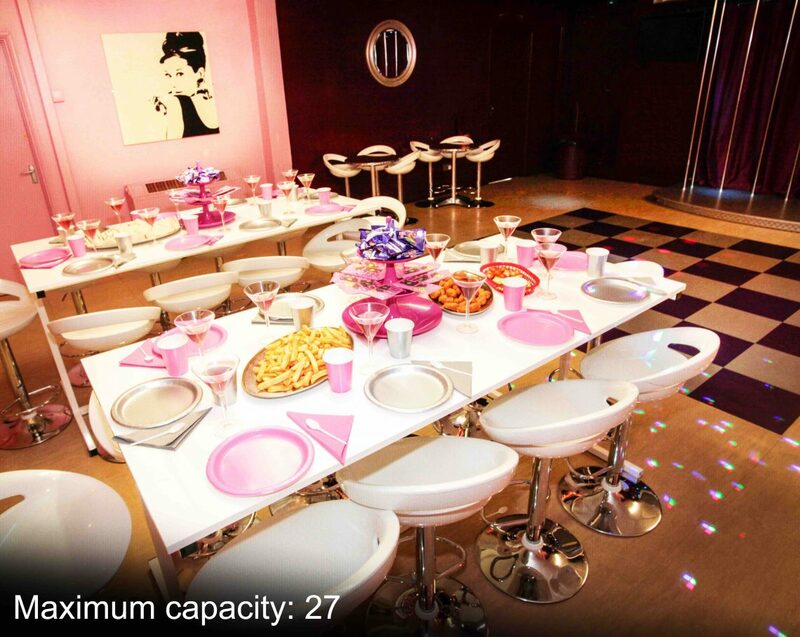 Premium parties have access to their party room for the duration of the party. If guests bring siblings who pays? The adult accompanying the children should pay standard admission for the sibling on arrival. If they fail to do so, as the party host you will be responsible. I can’t find the answer to my question in the Party FAQs, how can I contact you? If you can’t find the information you are looking for in our FAQs, please email Email or call us on 01582 660111. To book your party, please click here. Just fill in this form and your sixth child will go free. You can also choose to receive our monthly email with more savings for you to enjoy. Get the latest offers and news via Facebook & Twitter.